The downside of the creative process, whether it’s in cooking or anything else, is that we don’t always get it right the first time. Sometimes it doesn’t taste quite right—the spicing, texture, or combinations of flavors are off—these are opportunities for improvement next time. Sometimes it’s a colossal failure. These recipes might never be saved. Have you failed at a recipe lately? Gotten a little too creative? How about sharing with us? If you have a photo, so much the better! No one ever said the creative process is fail-proof, and sometimes we learn valuable lessons from failures. In my case, my new motto is never use more than one—or maybe two—strange ingredients in a recipe. Back in February I had a colossal FAIL. Working as many of us do with a recipe from the internet while adding my own creative touches, I was basically second-guessing the cook who knew better. I named my creation Cheesy Leek Bake, which should have been a hint that it would FAIL. 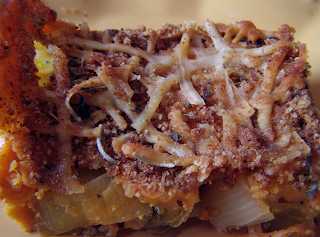 We’d gotten leeks for weeks from our CSA, so I thought a Leek Bake would (1) use them up and (2) be an opportunity to savor the taste of leeks without other vegetables interfering. I was thinking leeks with a cheese sauce, but this was wrong thinking. 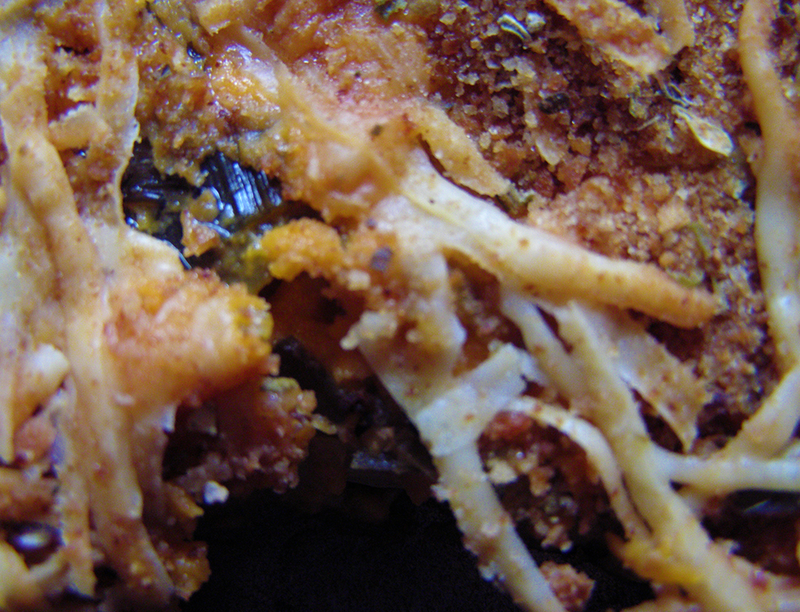 The original cook was thinking more along the lines of scalloped potatoes, using leeks instead of potatoes. Essentially plopping leeks in a baking pan, adding a milk, butter, flour, and cheese sauce, topping with breadcrumbs and parmesan and baking. Biggest FAIL was the cheese sauce. When I saw skim milk as an ingredient, I thought it was too wimpy for the sauce, and substituted evaporated skim milk (wrong!). I’d never worked with Olestra or quinoa flour, both of which the cook had substituted for health reasons. I also couldn’t find the soy cheese she used, so substituted another that claimed “It Melts!” on the wrapper. It did melt…eventually. There’s a first time for everything, including using a wire whisk to smash cheese substitute into tiny pieces while stirring a cream sauce. By the time the cheese melted, the olestra-milk-flour-cheese concoction was so thick I could barely pour it. In fact, the texture of the not-cheese made it solidify immediately as I poured it onto the leeks in the baking pan. I had to spread it with the spoonula, and tamp it down to mix with the leeks before adding the breadcrumb and parmesan topping. I optimistically baked it, but at the table it was…FAIL. My new rule is never use more than one strange ingredient in a recipe, two at most (notice how the creative urge is trying my limits already). Next time I’ll try the roux with olestra and all purpose flour (not quinoa). I’ll use the skim milk, not evaporated. I’ll go with regular cheddar cheese, maybe reduced fat to improve healthfulness. I’d also use a smaller pan so there was at least a one-inch layer of leeks on the bottom. And I will not add extra pepper and Tabasco if it doesn’t taste quite right. Do not substitute more than one ingredient. Do not use more than one “strange” ingredient with which you’re not familiar. Do not continue to add pepper (or salt) if it doesn’t taste right. If the recipe has been altered already, be conservative in altering it further. If the recommended pan size doesn’t seem right, it’s probably not right. If it doesn’t look right, it’s probably not right. Already, I am bargaining with myself about my new rules. How about substituting two ingredients, and can I use a strange ingredient AND substitute an ingredient or two? Such is the creative process. As long as I can laugh about it and learn from my mistakes, all is well.